Mr. President, today we commemorate the 50th anniversary of the end of World War II in Europe. Victory in Europe Day is one of the milestone dates of this century. I rise today to honor a group of Americans who made a large contribution to the Allied victory in Europe while also enduring more than their fair share of personal suffering and sacrifice: The brave men who were prisoners of war. I believe it is appropriate to commemorate our World War II POW’s by describing one incident from the war that is emblematic of the unique service rendered by those special people. This is the story of an 86-day, 488-mile forced march that commenced at a POW camp known as Stalag Luft IV, near Gross Tychow, Poland, on February 6, 1945, and ended in Halle, Germany on April 26, 1945. The ordeal of the 9,500 men, most of whom were U.S. Army Air Force Bomber Command noncommissioned officers, who suffered through incredible hardships on the march yet survived, stands as an everlasting testimonial to the triumph of the American spirit over immeasurable adversity and of the indomitable ability of camaraderie, teamwork, and fortitude to overcome brutality, horrible conditions, and human suffering. Bomber crews shot down over Axis countries often went through terrifying experiences even before being confined in concentration camps. Flying through withering flak, while also having to fight off enemy fighters, the bomber crews routinely saw other aircraft in their formations blown to bits or turned into fiery coffins. Those who were taken POW had to endure their own planes being shot down or otherwise damaged sufficiently to cause the crews to bail out. Often crewmates–close friends–did not make it out of the burning aircraft. Those lucky enough to see their parachutes open had to then go through a perilous descent amid flak and gunfire from the ground. Many crews were then captured by incensed civilians who had seen their property destroyed or had loved ones killed or maimed by Allied bombs. Those civilians at times would beat, spit upon, or even try to lynch the captured crews. And in the case of Stalag Luft IV, once the POW’s had arrived at the railroad station near the camp, though exhausted, unfed, and often wounded, many were forced to run the 2 miles to the camp at the points of bayonets. Those who dropped behind were either bayonetted or bitten on the legs by police dogs. And all that was just the prelude to their incarceration where they were underfed, overcrowded, and often maltreated. In February 1945, the Soviet offensive was rapidly pushing toward Stalag Luft IV. The German High Command determined that it was necessary that the POW’s be evacuated and moved into Germany. But by that stage of the war, German materiel was at a premium, and neither sufficient railcars nor trucks were available to move prisoners. Therefore the decision was made to move the Allied prisoners by foot in a forced road march. It was a march of great hardship * * * (W)e marched long distances in bitter weather and on starvation rations. We lived in filth and slept in open fields or barns. Clothing, medical facilities and sanitary facilities were utterly inadequate. Hundreds of men suffered from malnutrition, exposure, trench foot, exhaustion, dysentery, tuberculosis, and other diseases. A number of American POW’s on the march did not survive. Others suffered amputations of limbs or appendages while many more endured maladies that remained or will remain with them for the remainder of their lives. For nearly 500 miles and over 86 days, enduring unbelievably inhumane conditions, the men from Stalag Luft IV walked, limped and, in some cases, crawled onward until they reached the end of their march, with their liberation by the American 104th Infantry Division on April 26, 1945. Unfortunately, the story of the men of Stalag Luft IV, replete with tales of the selfless and often heroic deeds of prisoners looking after other prisoners and helping each other to survive under deplorable conditions, is not well known. I therefore rise today to bring their saga of victory over incredible adversity to the attention of my colleagues. I trust that these comments will serve as a springboard for a wider awareness among the American people of what the prisoners from Stalag Luft IV–and all prisoner of war camps–endured in the pursuit of freedom. I especially want to honor three Stalag Luft IV veterans who endured and survived the march. Cpl. Bob McVicker, a fellow Virginian from Alexandria, S. Sgt. 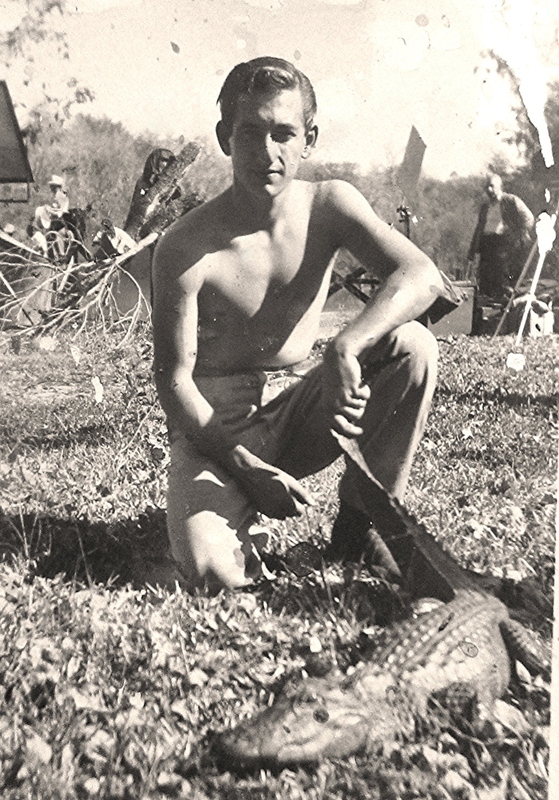 Ralph Pippens of Alexandria, LA, and Sgt. Arthur Duchesneau of Daytona Beach, FL, brought this important piece of history to my attention and provided me with in-depth information, to include testimony by Dr. Caplan, articles, personal diaries and photographs. Mr. McVicker, Mr. Pippens, and Mr. Duchesneau, at different points along the march, were each too impaired to walk under their own power. Mr. McVicker suffered frostbite to the extent that Dr. Caplan told him, along the way, that he would likely lose his hands and feet–miraculously, he did not; Mr. Pippens was too weak from malnutrition to walk on his own during the initial stages of the march; and Mr. Duchesneau almost became completely incapacitated from dysentery. By the end of the march, all three men had lost so much weight that their bodies were mere shells of what they had been prior to their capture–Mr. McVicker, for example, at 5 foot, 8 inches, weighed but 80 pounds. Yet they each survived, mostly because of the efforts of the other two–American crewmates compassionately and selflessly helping buddies in need. Mr. President, I am sure that my colleagues join me in saluting Mr. McVicker, Mr. Pippens, Mr. Duchesneau, the late Dr. Caplan, the other survivors of the Stalag Luft IV march, and all the brave Americans who were prisoners of war in World War II. Their service was twofold: first as fighting men putting their lives on the line, each day, in the cause of freedom and then as prisoners of war, stoically enduring incredible hardships and showing their captors that the American spirit cannot be broken, no matter how terrible the conditions. We owe them a great debt of gratitude and the memory of their service our undying respect. Information in the above commemoration is sobering. I must point out, however, that it is not entirely accurate. The march did indeed start on February 6, 1945, but for many of the prisoners it did not end until May 2, 1945. There were several groups, or columns, of men marching. My father, George Edwin Farrar, was in the group of men that were still on the road until May 2, when they were liberated by the British. If you calculate the dates, the number of days between February 6 and May 2, 1945 is 86. 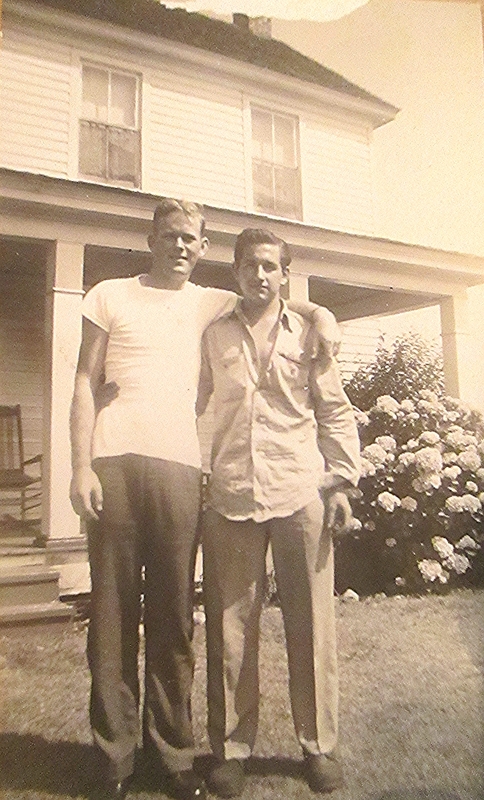 Along with my father, who was the sole survivor from the Buslee crew aboard Lead Banana, two of the three survivors from the Brodie crew aboard Lazy Daisy were also imprisoned at Stalag Luft IV. They were Harry Allen Liniger and Wilfred Frank Miller. And Liniger and Miller were later joined at Stalag Luft IV by former crewmate William Edson Taylor just one week after they were captured. It is March 28, 1945. For George Edwin Farrar, Harry Allen Liniger, Wilfred Frank Miller, and the rest of the former prisoners of Stalag Luft IV, it is the fifty-first day of marching. The prisoners were divided into large groups or “columns” for the march. Farrar, Liniger, and Miller may or may not have been part of the same column. Such records do not exist. For Farrar and Miller, we are unsure exactly where in the march they were on that day, but we do know where Harry Liniger was. Harry was boarding a train. 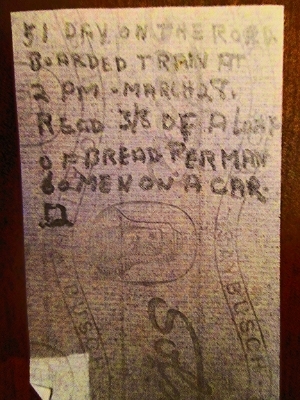 A note Liniger wrote that day on a piece of cigarette rolling paper was recently found tucked into his New Testament by his son, Harry. Almost 69 years later, it briefly describes that day. 51 day on the road. Boarded train at 2PM March 28. Recd [received] 3/8 of a loaf of bread per man. 60 men on a car. Joseph P. O’Donnell, another former prisoner of Stalag Luft IV, describes that day in more detail in his book, The Shoe Leather Express. O’Donnell writes that they arrived at 3PM and were loaded sixty-five men to each boxcar – boxcars that were designed to hold forty men or eight horses, providing the name “the 40 and 8.” They were “jammed into the boxcars and the doors were sealed shut.” O’Donnell continues to describe the scene, explaining that there was not enough room for all of the men to sit down at the same time. The sick were allowed to lie down and the rest of the men took turns sitting and standing. 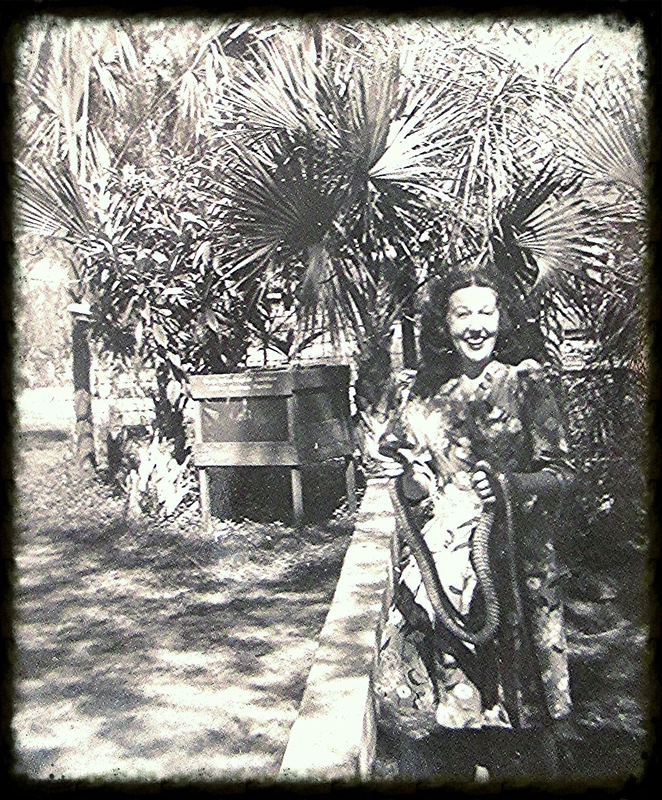 O’Donnell described conditions in the boxcars as “unbearable”, considering the number of P.O.W.’s with chronic dysentery. The men were denied water that was available nearby during their torturous wait. Finally, on March 30, after forty hours of confinement, the train began its journey to Fallingbostel, a thirty mile trip. The men were never let out of the boxcars until they arrived in Fallingbostel. From the Fallingbostel train station, the men were marched to Stalag Luft XIB. Thank you to Harry Allen Liniger, Jr. for sharing his father’s note. 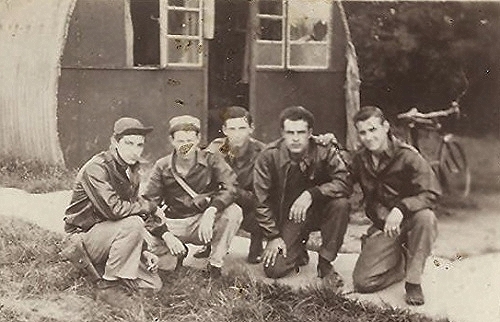 Three of the survivors of the September 28, 1944 mid-air collision between Lazy Daisy and Lead Banana – George Edwin Farrar, Harry Allen Liniger, and Wilfred Frank Miller – were being held as prisoners of war in Stalag Luft IV. Stalag Luft IV was located in Gross Tychow, Pomerania, which is now Tychowo, Poland. Near the end of WWII, with Allied forces advancing from the west and the Soviet Red Army advancing from the east, the Nazis began a series of forced marches of prisoners out of the prisoner of war camps. There is no definitive answer as to why the prisoners were marched from the camps or what the Nazis planned for them in the end. One theory is that the prisoners were marched out of the camps simply to delay their liberation. By the end of January 1945, the plan to march allied prisoners out of Stalag Luft IV and away from liberation by the Soviet Red Army was ready to begin. The winter of 1945 was one of Germany’s coldest on record with blizzard conditions. The prisoners of Stalag Luft IV were ill-equipped for a march in such weather. They had been underfed and were not clothed properly for the conditions. Back home, the relatives and friends of Farrar, Liniger, and Miller pictured the three dealing with the hardships of prison camp life. They had no idea their loved ones were enduring something even worse. “The March” meant walking fifteen to twenty miles a day. It meant very little food. It meant sleeping in piles of hay in barns and sometimes out in the open. It meant exhaustion, illness, and starvation. Some would not reach liberation, but most just kept marching, with thoughts of home and family keeping them going. Harry Allen Liniger was born on August 9, 1924 in Steubenville, Ohio to Paul W. and Estella P. Liniger. Harry was named for an uncle, his father’s brother Harry, a WWI veteran. Harry and his friend, Dink, both graduated from the Edwards Military Institute. At the age of 18, Harry – the Brodie crew waist gunner – enlisted in the Army Air Corps on March 24, 1943 at Fort Bragg, North Carolina. The courthouse where he enlisted was the very same courthouse at which his future wife’s great-grandfather enlisted in the Confederate States Army. 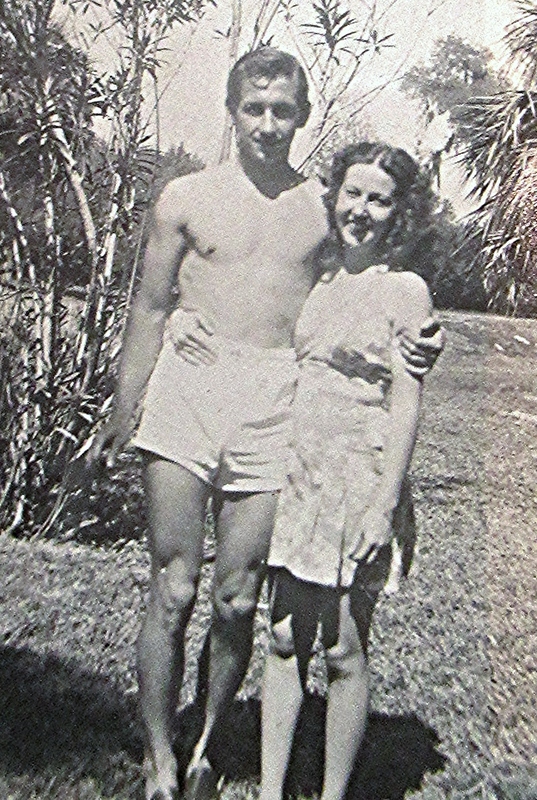 While Harry was serving his country in the Army Air Forces, his sweetheart, Carrie Belle Carter, waited for him here at home. 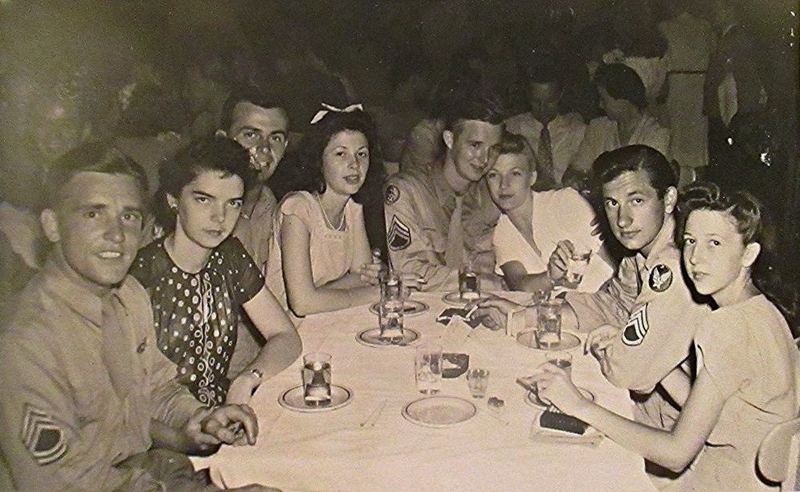 During the war, Carrie worked at a German POW processing center in Newport News, Virginia. After his training in the states, Harry was sent to the air station at Grafton Underwood, England. There he was part of the Eighth Air Force, 384th bomb group, 545th bomber squadron, a waist gunner on the John Joseph Brodie crew. 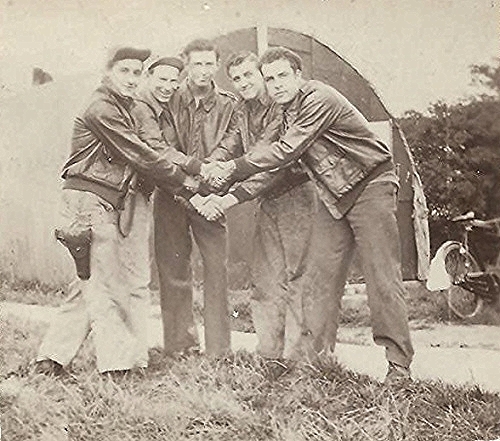 Harry flew his first mission on August 7, 1944. 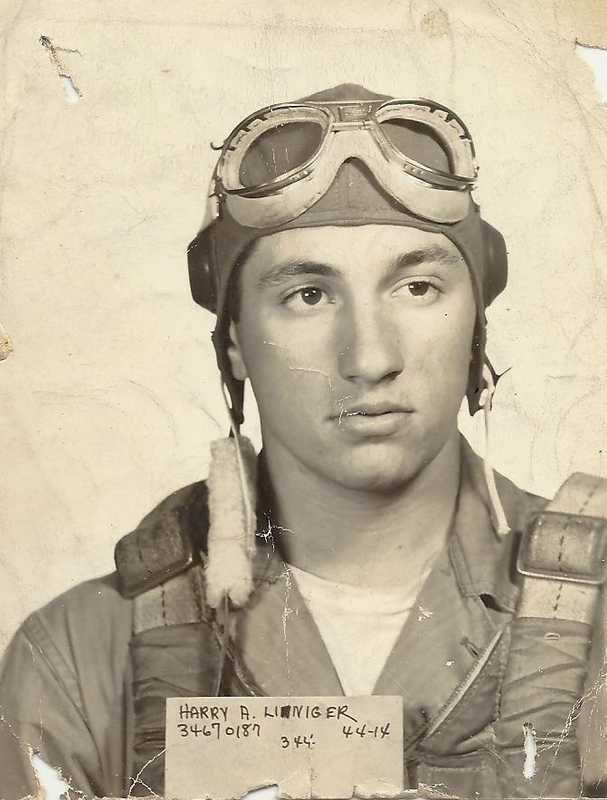 Flying his 16th mission with the James J. Brodie crew on September 28, 1944, Harry Liniger was aboard the Lazy Daisy. 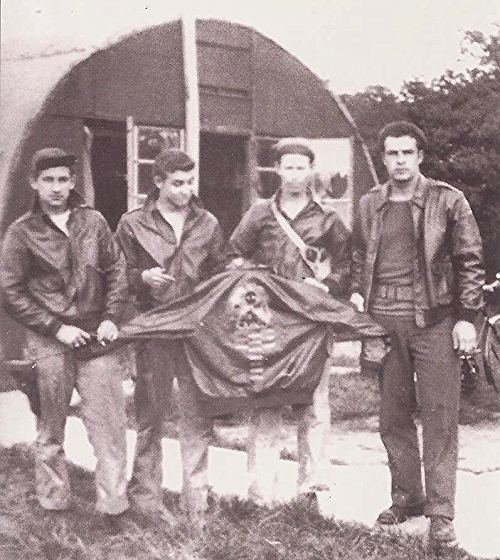 Harry and his crewmates were involved in a mid-air collision with the Lead Banana coming off the target at Magdeburg, Germany. With the Lazy Daisy going down, as Harry attempted to escape through the waist door, an explosion threw him from the ship. Harry survived the collision and became a prisoner of war, one of only three men from the Lazy Daisy to survive. Harry Liniger was held prisoner at Stalag Luft IV and was part of the Black March that started on February 6, 1945. He was eventually liberated in late April or early May, 1945 and returned to the states. The other man identified in the above photo, Robert Doyle Crumpton, was the engineer/top turret gunner for the Brodie crew. He was aboard Lazy Daisy on September 28, and did not survive the mid-air collision. The unidentified men in the photographs may have been other Brodie crew members assuming the photos were taken at Grafton Underwood. 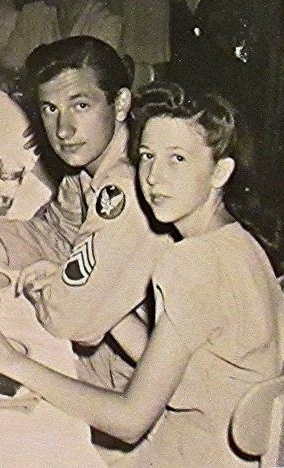 After returning to the states, while still on active duty, Harry and Carrie Belle married on July 26, 1945. 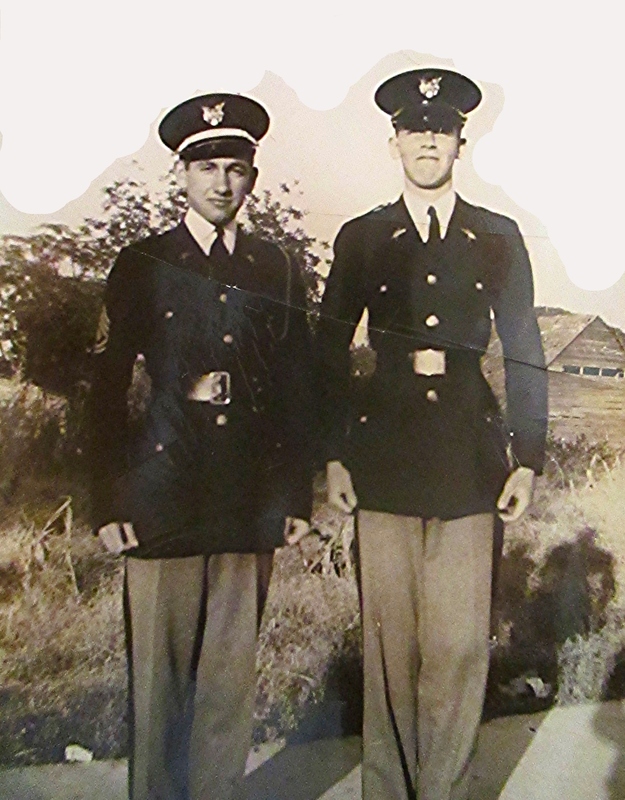 Harry Liniger was discharged from the Army Air Forces on October 31, 1945. Thank you to Harry Liniger, Jr., Harry’s son, for supplying the photos and information presented in this post.